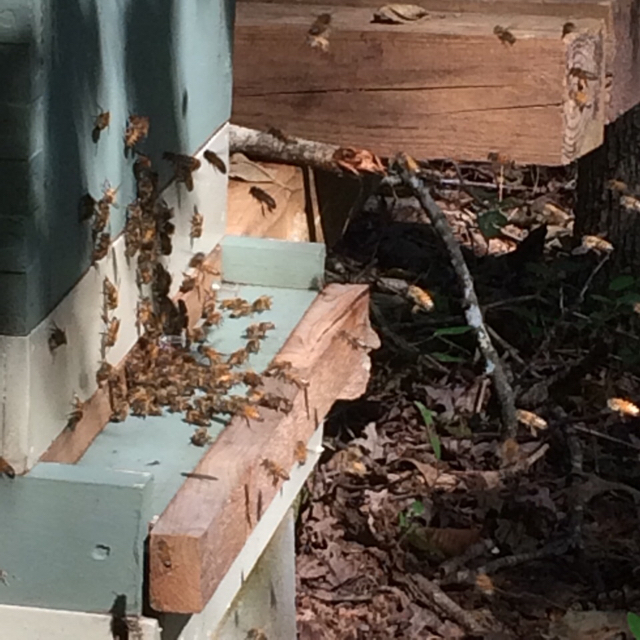 Packages in mid May and initially lost 1 queen in 1 hive shortly thereafter which I replaced. Hive two also lost queen several weeks later and by time I realized what was going on (no eggs/larvae scattered capped brood the population had dwindled. A new queen was installed but she either left or was killed shortly after release. I subsequently purchased a local Nuc in mid August and installed. Hive 1 was treated with Apivar in mid-July and Hive 2 was treated with same following installation. Both hives were fed continuously and were packing it in. A second deep was added to each as space was utilized in the initial deeps. All this being said to bring us up to yesterday’s inspection. Hive one - nice brood pattern in bottom deep and top deep nearly full with 3 frames capped, 3 frames 1/2 capped 1/2 nectar, remaining frames in various lesser stages of capped/nectar. I did a sugar roll on this hive as Apivar was removed at end of treatment interval in early September. I saw one mite. This not have been the thing to do but I added a medium of drawn/partially drawn foundation to provide additional storage space and hopefully capitalize on a fall flow. I know they’re packing in the pollen as golden rod is blooming along with what I believe are asters. The hive is robust in population. Nest down on there own? This is an orientation flight beginning on hive 1 yesterday. Almost like clockwork each day around 3:30. When both hives start at same time it’s a sight. I at first thought robbing taking place until you notice no fighting and after about 30 minutes or so everything is back to normal. The main question after dealing with mites & going into winter, is how much honey is stored in each hive...? Experienced beekeepers in your area can tell you the minimum honey stores recommended for a typical winter in your area - remember, all beekeeping is local. I would guess that a second super mostly filled with honey would probably be enough in NC, but you will need to check on honey stores in Feb and Mar. Be ready for emergency feeding at that time if necessary - that is a subject unto itself. Early in the season, it is common to find the brood nest in a super above the hive body, it is a natural thing to see. As the honey flow develops, the upper frames are filled with honey pushing the brood nest back down to the lower hive body. In spring, I'd say don't worry about the brood nest in a super because the honey flow will push it back down. In fall, I would consolidate the brood nest in the bottom hive body, while placing honey frames on both sides of the brood nest and in the supers above it. Determine where the honey is. Honey below the cluster does not help the bees when they are in there winter cluster. But by feeding heavily the bees will back fill the combs as the brood emerges. the question is do they need the extra stores for winter or is the bottom box full of stores and the frames need to be manipulated? You will find the answer on your next inspection. Great info folks, thanks for sharing.... Have been dealing with similar type situation and find the discussion enlightening. I too am wondering about my hive's activity. Some days it looks like robbing, some days it doesn't. Can't decide if I should close it up and hope to nurse them through winter, or if it's just the drones getting kicked out and everything is healthy? Waaaaayyy too ornery for me to get in there and do an inspection. I get attacked if I spend more than 60 seconds watching the thing from a few feet away (previously I could spend hours without being bothered). I had a chance to get back into the hive today. The hive with brood in upper deep still had it there. As a matter of fact the queen was up there and laying up a storm. There were all stages of brood from eggs to capped. The bottom deep also had capped brood on 3 partial frames (maybe 3/4 frame total brood). I moved these 3 frames into the upper deep and all honey frames into the bottom replacing the removed frames of brood. I then reversed the hive bodies so that brood will be on bottom of stack and stores on top. Hopefully this will set the girls up for winter and my messing will not have confused things. While at it I also did a sugar roll with a result of 1 mite in the approx 1/2 cup of bees (300). Interesting video! Odd that it popped up today.